Forget What Did: I also like how disappointed they look. That truly is an excellent version of the "seemingly non-diegetic sound is actually diegetic" trick/joke. Not just well conceived, but well handled. Thanks for pointing it out. Alas I have no idea if there are any earlier versions. This is pretty early in the sound era for such meta-tricks but the meta-tricks always start earlier than I think. As for later examples (for which you did not ask), one that leapt to mind takes place early in Mel Brooks' High Anxiety when a string orchestra is revealed to be traveling next to Brooks' vehicle on the highway. My abject apologies. I said "string orchestra" but in recollection I believe it's actually a full orchestra --- possibly identified as the Los Angeles Philharmonic on the side of the bus. I distinctly recall brass instruments, at any rate. I have thought of no examples prior to 1941 however. Sorry. 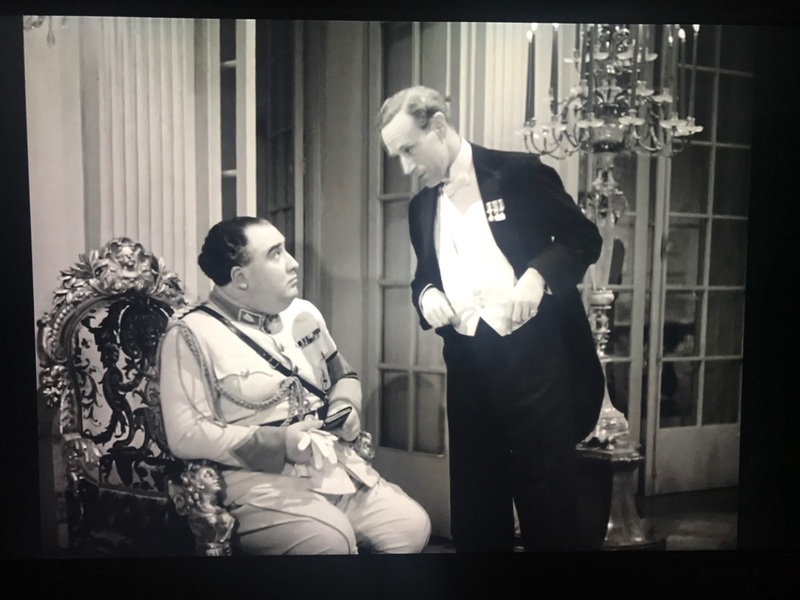 It's interesting that 7 yrs earlier Leslie Howard played the Scarlet Pipernel in a film which was set in the original setting. Perhaps Pipernel Smith is actually a time travel story! Hello! Sorry, this comment has nothing to do with Pimpernel Smith, but I don't know how else to contact you. My husband and I came to see you a couple of weeks ago at the Kensington Central Library; we enjoyed the show greatly, it was very funny - and clever - stuff! You interspersed the new material with material written for Mitchell and Webb, in which old ladies interview people with silly jobs. I remember hearing these when performed by Mitchell and Webb, but I either missed or forgot the start when you tell us that Joanna Lumley is now our dictator. I rmeember reading years ago that if she had her way, she'd be a 'benevolent despot' - it struck me as a very good idea at the time; was this also your kicking off point for the sketch?